My Brief Stroll Down the Tobacco Road. The Tyrrell Public Library in Beaumont, Texas during the years of my childhood was the site of many happy hours spent browsing for books to read. I was too young to appreciate the building itself for its beauty, of course. 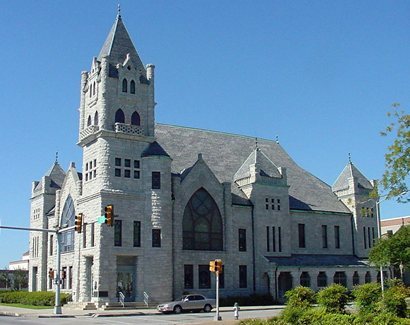 Once a Baptist church built at the beginning of the 20th century, it was subsequently donated for use as the city's library some time in the 1920's. I think. My very first exposure was a day during the summer before third grade, in 1957, when my mother took my brother and me to get our first library cards. It was very likely on a Saturday afternoon since that was her half day off from work for many years. After trudging up what seemed like a hundred feet on creaky wooden steps built in a boxed in, very narrow, very steep spiral, we emerged in the children's section. We went through the necessary process to obtain what amounted to free admission to a candy store of printed delights. The building resembled a huge castle from the exterior, and the children's library was placed in what I think must have been a turret or tower, I don't know the correct term, which was lit by some natural light in addition to the electric ones. Very cozy, it was, and I loved it at first sight. I was mortally afraid of heights, still am not crazy about them, and the stairs terrified me, so my willingness to brave the climb is testimony to the degree of my reading addiction. I'm sure a good many pages were soaked with the cold sweat of my fear. In spite of the limit on the number of books one could check out at each visit, I made my way through just about everything in my age level in two years. By the summer before fifth grade the librarian informed me I had outgrown this section and asked my mother if I could start going �downstairs.� Heaven, I was in seventh heaven when she said yes. The earliest memory I have is of standing on a step gazing at all of the tall shelves, so many more than I had ever seen in one place. I may have felt overwhelmed, I guess, or drunk on the notion of �all of this can be mine.� Who remembers that many decades ago? Mr. Dewey Decimal and I entered into a long and beautiful friendship, well, until the Library of Congress Classification System came between us. This brings me to the subject of my recollection. I don't remember exactly when it took place, but it was fairly soon after I graduated to downstairs. While browsing shelves immediately to the right of the front entrance I ran across a title on the spine of one volume that triggered a memory and I pulled it down to have a look. The book was Erskine Caldwell scandalous novel about a family of extremely poor Southern sharecroppers, Tobacco Road. I recognized the title, or maybe it was an association with a term used by my mother to describe people and situations way down on the ladder of life that were definitely to be avoided, and decided to make it one of my selections that day. After making all of my choices I went to the main desk to begin the check out process. The librarian, who seemed very old to me but was probably only in her early 50's, at most, helped me. When she picked up Mr. Caldwell's dark tale her demeanor changed slightly, but I was too young and too ignorant to do more than barely register it. I'm sure I promptly forgot about it. I was a kid and it's what they do. I recall her asking if I was sure I wanted that book and with my affirmative reply she said something about needing my mother or father's permission first. My folks were divorced and my brother and I lived with our mother so it fell to her to say yea or nay. The �library lady� called her at work, got the necessary consent and the die was cast. I was spending the day downtown by myself, naturally feeling pretty grown up, and I planned to do some shopping until my Mom picked me up at the library after work. The shopping was mainly window type at Kress's, Woolworth's, Neisner's and Morgan & Lindsey's, the four five and dimes (yes, I know, groan) located within a couple of blocks of one another and of the library. They were crammed with an intoxicating amount of �stuff� to see and drool over. I nearly always began these days with breakfast at the lunch counter at Morgan & Lindsey's, which opened before the rest of the store, and enjoyed two large, hot, fluffy nickel biscuits and, gasp, a fountain cherry Coke served in a cone shaped paper cup sitting in a burnished metal holder, also five cents, plus a nickel for the tip. That tip was pretty important, according to my mother who had �hopped cars� as a young woman. When the stores opened I'd begin traipsing up and down the aisles looking at the things that caught my interest. I rarely had much money to spend, but it cost nothing to look and look I did. Tangee lipstick was my favorite item at the cosmetic counters. I just loved it's distinctive sweet scent and couldn't figure out how it's bright orange color could turn a brilliant deep rose after it was applied. No other scent is like it and I think I can still smell it in the olfactory part of my brain, only just. Sometimes there were lipstick and cologne testers available and I'm pretty sure I went home looking and smelling like a bawdy house trainee a few times. (See Crockett Street in Beaumont.) Sometimes I picked out my books early in the day and then had to lug them all over that part of downtown, from store to store, but I wised up eventually and did my shopping first. Midday usually found me sitting atop a tall stool at Kress's lunch counter, short, stumpy legs dangling, dining on the best tasting hot dog with chili ever served anywhere in the universe, accompanied by a side of Dentler Maid potato chips and, yep, you guessed it, another fountain cherry Coke. Same beverage, different station. I believe the dogs were fifteen cents but I wouldn't stake my life on it. But I digress, something for which I have a real talent in case it ever becomes an actual profession. The librarian did call my mother at work and she, not being a big reader of fiction and no doubt unaware of the scatological content of Mr. C's sociologic study of poverty in the Deep South, okayed the loan. I was equally clueless, given my tender years, so I read the entire book with absolutely no earthly idea what it was all about and have only a single, extremely fuzzy memory of a couple of people up in a tree. I had no idea what they were up to so high in the branches (pun noted) until I read the book as a young adult. Then it all seemed just sad, tawdry and repellent and the patches of humor too black for me to appreciate. My take on it as a child was that it was a book and therefore I was compelled to read it. I read cereal boxes, my brother's Boy's Life magazines, movie posters, GRIT, advertising signs, church bulletins, comic books, in short, just about anything containing the printed word. I devoured print the same way I devoured those biscuits at the Morgan & Lindsey's lunch counter. The major fallout from my early meander on the wrong side of the literary tracks came from my father, and it was much more than a couple of inches to the conservative right of the librarian's slightly raised eyebrows and pursed lips. In those days my brother Butch and I used to go downtown to visit him for a couple of hours each week or two. He lived in one of the hotels there and would send a cab for us. He nearly always quizzed us with the standard adult's catechism, what and how we had been doing in school and whether we were minding our mother, and often he asked what we had been reading. Sad the day I rattled off the current list including the gloomy tale of the hapless Lester family. Willie's Edwardian roots ran deep and he accompanied us home that day in the cab. He and my mother had a heated discussion about my unsupervised reading habits which ended with Estelle snapping in exasperation, I daresay, �Oh, Willie, I haven't been able to keep up with what that kid reads for a long time and I don't intend to start now!� Thus, my First Amendment rights were protected under the Bill of Rights, as somewhat loosely interpreted by my mother.